If used with anything else than a certified audiometer, the output sound levels depend on the soundcard used. Very soft sounds may not be presented and very loud presentation levels may cause distortion. With this configuration the audio solution does not qualify as an audiometer according to ISO standards. The intonation tests use sounds with intonation. They aim to assess the low frequency coding with special interest for the temporal fine structure coding. 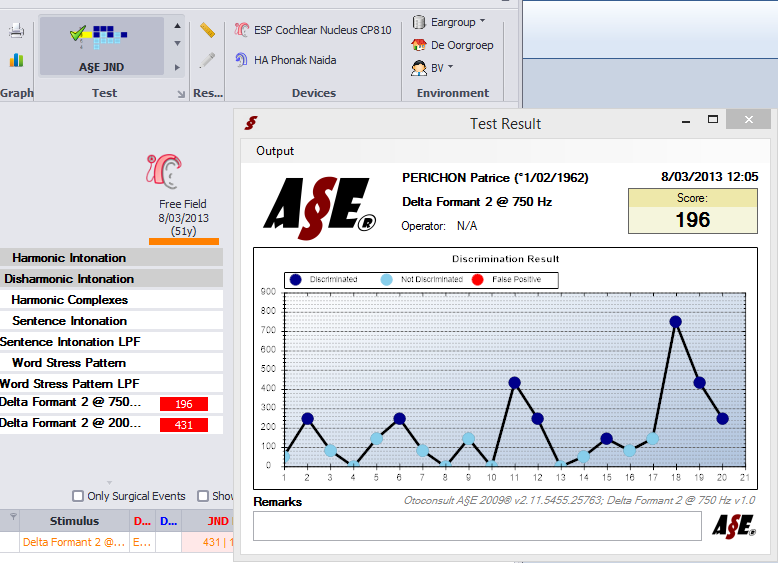 A§E intonation test results. Each column (left) represents a different test session with its own date and configuration of the hearing aids. Each test also comes with the course of the adaptive algorithm (right).